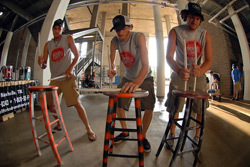 On July 25, 2008, the Pearl Corporation presented the Masters of the Summer Music Games in Murfreesboro, Tenn. As part of the event sponsorship, the company brought in a variety of special performers and exhibitions to show fans why Pearl calls itself "the best reason to play drums." Earlier in the day prior to the first of the eight best Drum Corps International corps up to that point in the season stepping off in competition, local students had the opportunity to get up close with the Santa Clara Vanguard as they presented an educational clinic session while rehearsing in the Middle Tennessee State University stadium. At the end of the night, the Blue Devils had captured their 17th straight win of the season, with the Cavaliers and Phantom Regiment taking second and third place. Read a recap of results from this event.